GAA Classic Cars’ Johnny Ransom had been suggesting for some time that I come to Greensboro for one of the GAA Classic Cars auctions. 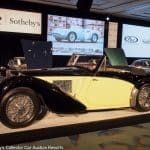 This spring auction’s schedule on the weekend before Amelia Island created the opportunity to combine both events in a single, long road trip. 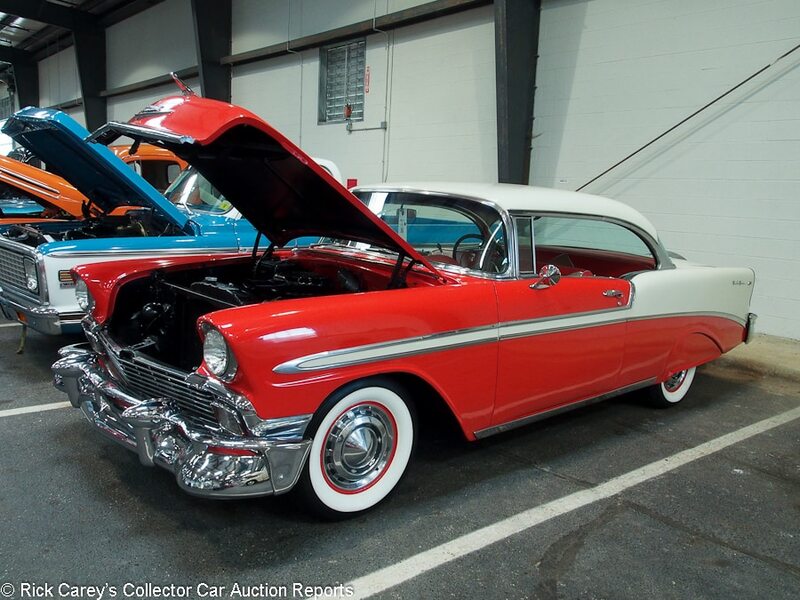 GAA Classic Cars is associated with the Greensboro Auto Auction, a multi-lane wholesale used car auction, and with the Greensboro dealerships owned by Dean Green. What I found upon arrival at GAA Classic Cars facility just off I-40 in Greensboro was amazing. 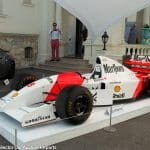 There are marvelous auction venues that exude automobile history. Worldwide’s Auburn location in the Cord Front Drive L-29 assembly building and Bonhams Paris auction in the Grand Palais, site of some of the earliest automobile salons, come to mind. And it’s tough to beat some of the settings in Monterey, Goodwood, Monaco or Amelia Island. But GAA Classic Cars is a standalone, dedicated facility for selling collector cars. The main building (formerly a cold storage facility) is spacious, well-lighted and comfortable with epoxy coated floors, diner-themed food service with plenty of tables, ample comfortable seating, even more comfortable mezzanine seating in newly-built skyboxes, a buffet service dining room upstairs for consignors, bidders, staff and guests. Check-in and registration are fast and efficient in a permanent office setting. There is good, strong Wi-Fi throughout the entire facility. Oh, and plentiful, clean, permanent bathrooms. Most of the 540 cars are displayed inside the 250,000 square foot facility, and soon they’ll all be inside after a new 100,000 square foot addition is completed. The cars drive onto the block but after that they’re pushed through the aisles by a fleet of Car Caddies or pulled by a team of electric golf carts to keep the air clear. It is superbly well organized, efficiently and amply staffed and flows with admirable dispatch. The auctioneers are local but the floor crew is made up of collector car auction veterans. Jerry Daisy does the block color. Kenny Garmin and Mike Steel field bids and represent the sellers. Chris Neuhauser wrangles post-block deals at the imaginatively-named “Deal Doctor” post. Both Phil Gees work the ring spotting bids. The block is a well-oiled machine dedicated to moving cars, and they are successful, as the numbers below show. Notably the vast majority of the cars are moderately priced – the sweet spot in 2018’s collector car market – with only a few lots sold in six-figure territory. I was, as you can infer, blown away by the facility, the presentation of the cars and the operation’s friendly efficiency and effectiveness. Commissions are only 7%, both ways. The cars presented here are sorted by Marque, Model, Body Style and Year for easier review. 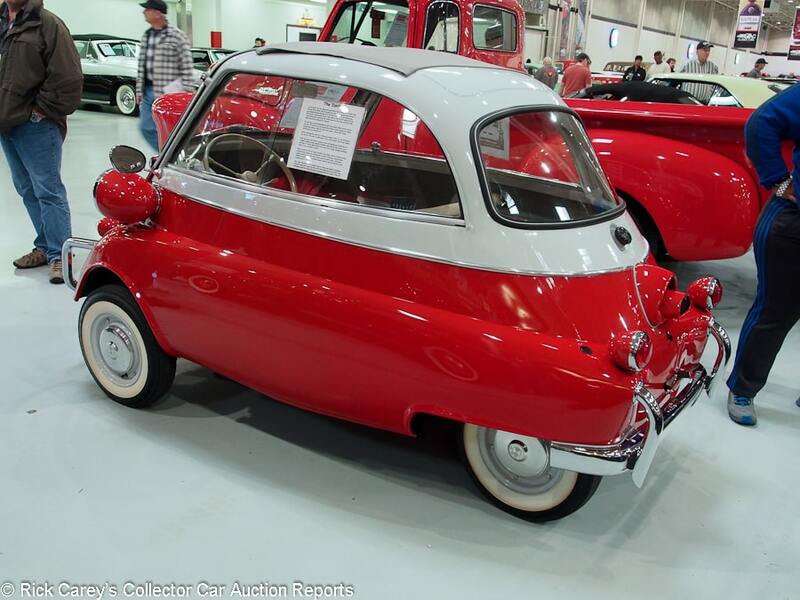 Lot # ST0067 1957 BMW-Isetta 300 Coupe; S/N 507702; Red, Light Grey/Beige vinyl; Recent restoration, 3+ condition; Hammered Sold at $31,500 plus commission of 7.00%; Final Price $33,705. No Reserve. – Light Grey wheels, hubcaps, whitewalls, Grey vinyl roof, chrome bumperettes. – Very good paint, chrome, interior and folding roof. Dull beltline molding. The steering column support, speedometer and knobs weren’t done. Superficially redone chassis, wheelwells slathered with sealer. Makes a great first impression that is compromised on a closer look. – It won’t take a lot to make a much better Isetta out of this, leaving the new owner the opportunity to turn it into sufficient profit to pay for the trip to Monterey this summer. 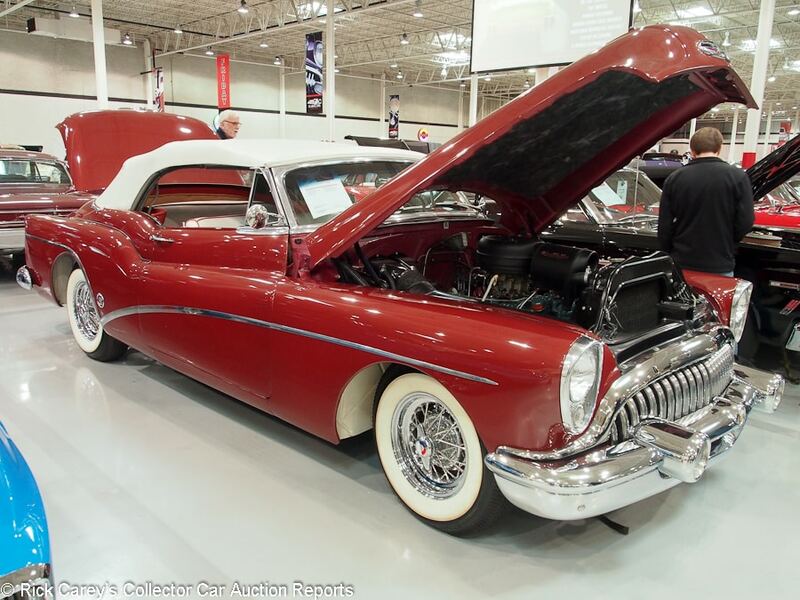 Lot # ST0147 1953 Buick Skylark Convertible; S/N 17127192; Mandarin Red/White, Mandarin Red leather; White vinyl top; Cosmetic restoration, 3- condition; Hammered Sold at $86,000 plus commission of 7.00%; Final Price $92,020. With Reserve. – Dynaflow, chrome wire wheels, wide whitewalls, power steering. – Mediocre old repaint, sound major chrome, scuffed trim chrome and stainless. Good interior. Creased and lightly soiled top. Dirty old engine compartment and chassis never fully restored and now rather discouraging. – The Greensboro bidders pinned the tail with the right price on this donkey, but will take a lot to make it into much more than it is. It really needs to come apart and be done again from the bottom almost all the way to the top, an expensive process that makes even this realistic price an impractical base from which to begin. 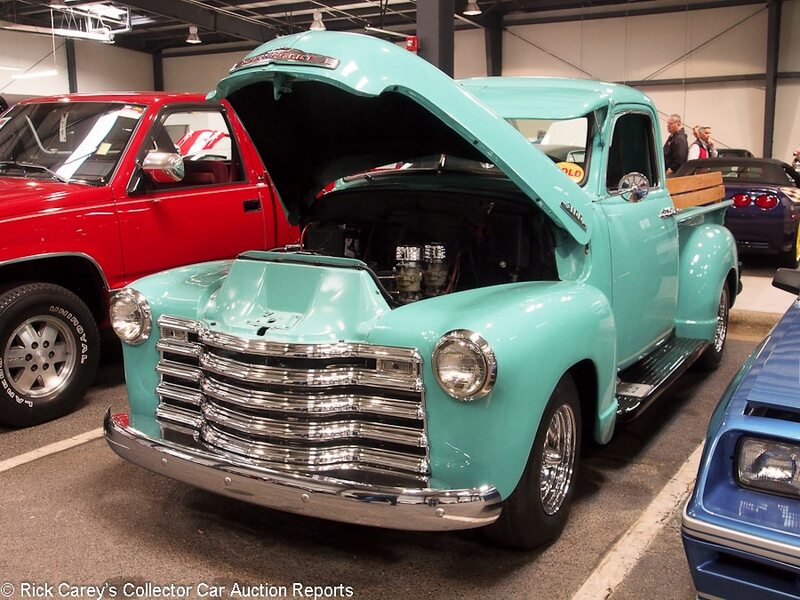 Lot # TH0072 1953 Chevrolet 3100 Pickup; S/N H53B003020; Light Green/Black leatherette; Truck restoration, 3 condition; Hammered Sold at $18,500 plus commission of 7.00%; Final Price $19,795. With Reserve. – Edelbrock intake with dual 1-barrel Rochester carbs, headers, dual exhaust, alternator, heater, column shift 3-speed, windshield visor, oil filter, wood bed floor and sideboards, chrome bumpers and grille, dual taillights, chrome fifteen inch Rally wheels, Falken tires. – Fair old repaint with minor edge chips. Good upholstery and chrome, except for gouged and scratched side window moldings. Good bed wood. Orderly engine compartment freshened for the auction. Exterior paint overspray on the underbody. A reasonable truck restoration. – Grandpas were explaining to their grandkids the pleasure of hearing a good-running Stovebolt with a split exhaust manifold (or in this case headers). This isn’t the best example around (far from it), but it’s more than good enough to drive with pleasure and be comfortable opening the hood at Cars and Coffee while being proud of this moderate price. 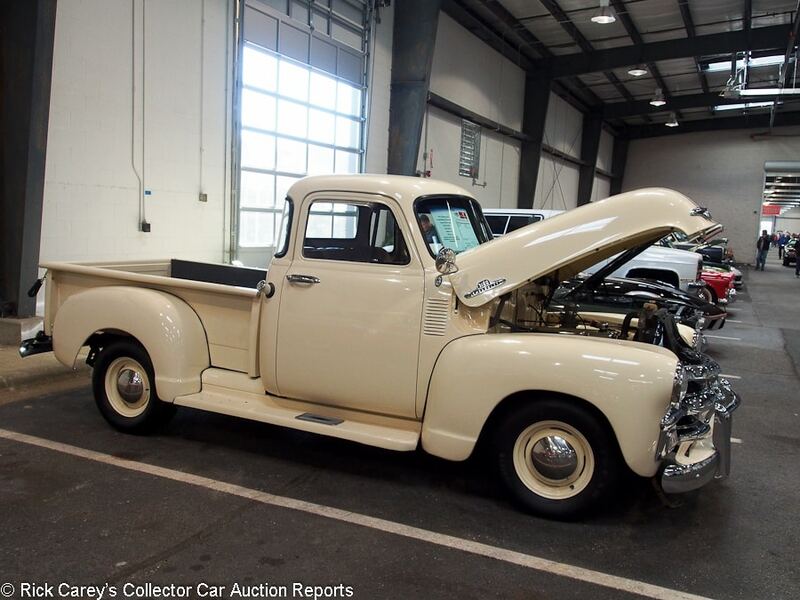 Lot # FR0113 1955 Chevrolet 3100 Pickup; S/N H550002746; Cream/Beige leatherette; Truck restoration, 3- condition; Hammered Sold at $22,000 plus commission of 7.00%; Final Price $23,540. With Reserve. – Heater, bed side spare, chrome bumpers, wood bed floor, chrome bed strips, dual taillights, 5-window cab, chrome valve cover, grille guard, aftermarket air filter. – Early ’55 with ’54-style cab. Good paint. Bed floor needs to be revarnished. Sound upholstery. Good gauges. Dirty, neglected old engine. A sound and usable old truck quality restoration. – This is what the Standard Catalog refers to as a ‘First Series’ 1955 Chevy truck. It sold for $21,450 at Barrett-Jackson in Scottsdale in 2011 and appears today to be pretty much as it was seven years ago, in condition and in price, which is appropriate. 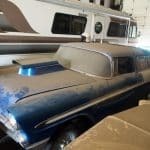 Lot # FR0111 1956 Chevrolet Bel Air 2-Dr. Hardtop; S/N VC56L036299; Engine # F56G; Matador Red, India Ivory/Red vinyl, Beige cloth; Visually maintained, largely original, 3- condition; Hammered Sold at $27,000 plus commission of 7.00%; Final Price $28,890. With Reserve. – 265/162hp with added 4-barrel, Powerglide, power steering, heater, wheel covers, whitewalls, skirts, pushbutton radio, continental kit. – Casual old repaint with chips and blemishes. Good bumper chrome but scuffed, dull other brightwork. Dull old dash and gauges. Grungy engine compartment superficially dressed up for the auction. Sound old upholstery with breaks in the chrome piping. 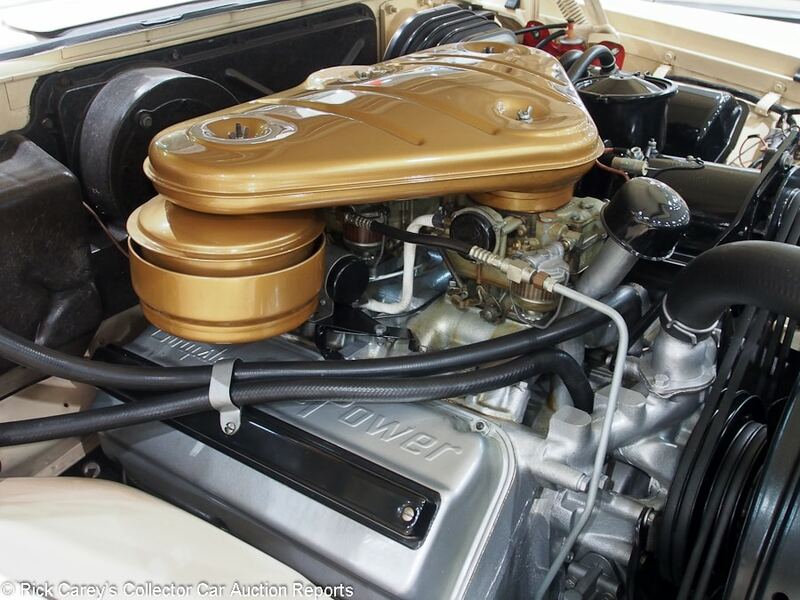 – The engine block is coded ‘G’ for a 3-speed 2-barrel, but that’s not what’s on the auction floor today, with fewer speeds in the slushbox and more barrels atop the intake manifold. It is presentably and usably cosmetically redone, sound and complete but not all that pleasing, and the result matches that condition. 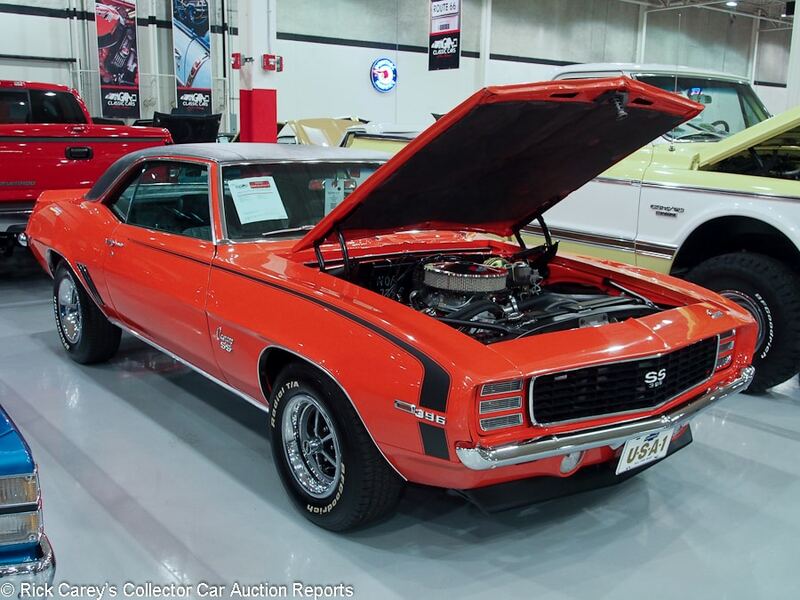 Lot # ST0117 1969 Chevrolet Camaro SS 396 2-Dr. Hardtop; S/N 124379N537626; Hugger Orange, Black vinyl roof/Black vinyl, houndstooth cloth; Recent restoration, 2 condition; Hammered Sold at $46,000 plus commission of 7.00%; Final Price $49,220. With Reserve. – 396/350hp, 4-speed, Hurst shifter, power steering and front disc brakes, AM-FM, SS style wheels with trim rings, Radial T/A tires. – Good paint with small fisheyes and cracks along the rain gutters. Decklid stands slightly proud. The engine compartment, underbody and chassis are restored like new with no sign of any use. Tight, fresh interior. A choice car. – The paint is a little troubling but overall it speaks of a quality, thorough restoration in attractive colors and a desirable drivetrain and equipment list. Sold for the same price as the similar Camaro SS 396 a few hours earlier, the restoration bespeaks the same quality and attention to detail and is a similarly sound value. 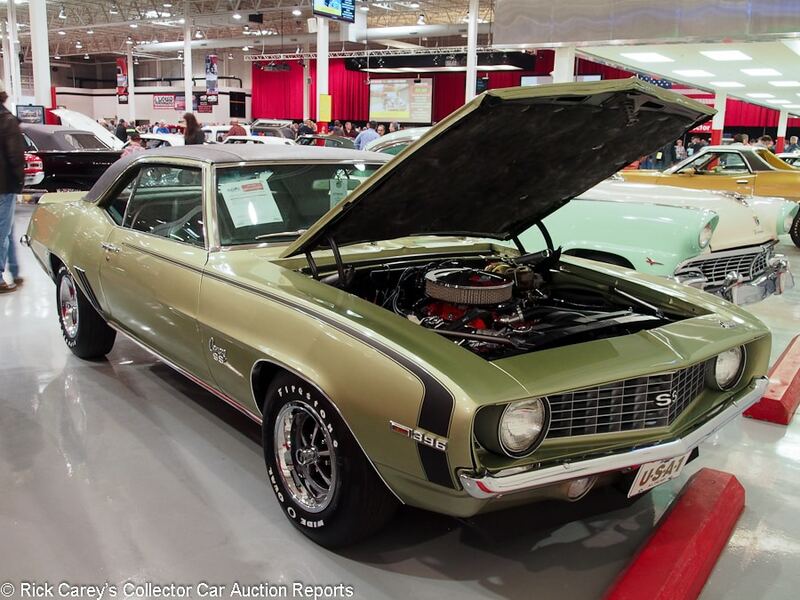 Lot # ST0055 1969 Chevrolet Camaro SS 396 2-Dr. Hardtop; S/N 124379N677856; Engine # …CJB; Light Green, Black vinyl roof/Dark Green vinyl; Recent restoration, 2+ condition; Hammered Sold at $46,000 plus commission of 7.00%; Final Price $49,220. With Reserve. – 402/350hp, 4-speed, Hurst shifter, SS wheels with trim rings, Wide Oval tires, power brakes, heater, no radio, console gauges. – Excellent clearcoat point aside from some dust motes excellent vinyl roof, chrome and interior. Crisp gauges. The engine compartment and chassis are like new. Better than new but not overboard. 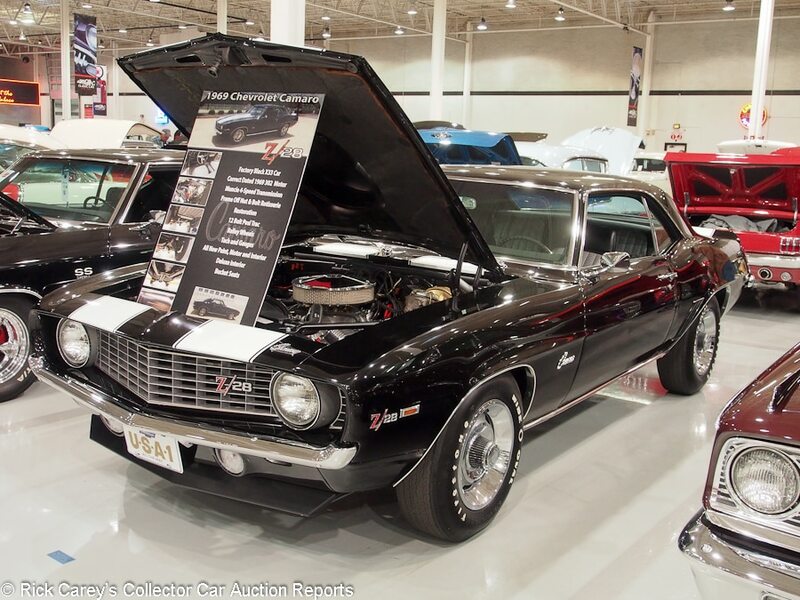 – The CJB block code corresponds to a ’69 Camaro 402/325hp with manual transmission, not exactly what is claimed for this Camaro, but only an air cleaner sticker away and the sale result here is also that close to being spot-on, a realistic value for a car that will be owned and driven with pride. Lot # ST0129 1969 Chevrolet Camaro Z/28 2-Dr. Hardtop; S/N 124379N573638; Black, White stripes/Black vinyl, houndstooth cloth; Recent restoration, 2 condition; Hammered Sold at $55,000 plus commission of 7.00%; Final Price $58,850. With Reserve. – 302/290hp (over 400 dyno horsepower), cowl induction, 4-speed, Hurst shifter, pushbutton radio, console gauges, sport steering wheel, power front disc brakes, Rally wheels with trim rings, Wide Oval tires, air dam. – Very good paint, interior, glass and chrome. The engine compartment, chassis, underbody and glass are like new. “Date code correct DZ engine.” – The result here is a severe penalty for the ‘Date code correct’ engine but leaves the new owner with the flexibility to install a reproduction cross-ram intake with dual quads for max underhood bling and performance without going too far into the red (financially; it would be seriously tempting to go into the red on the tach.) The price more than compensates for the swapped engine and is a seriously good value for the new owner. 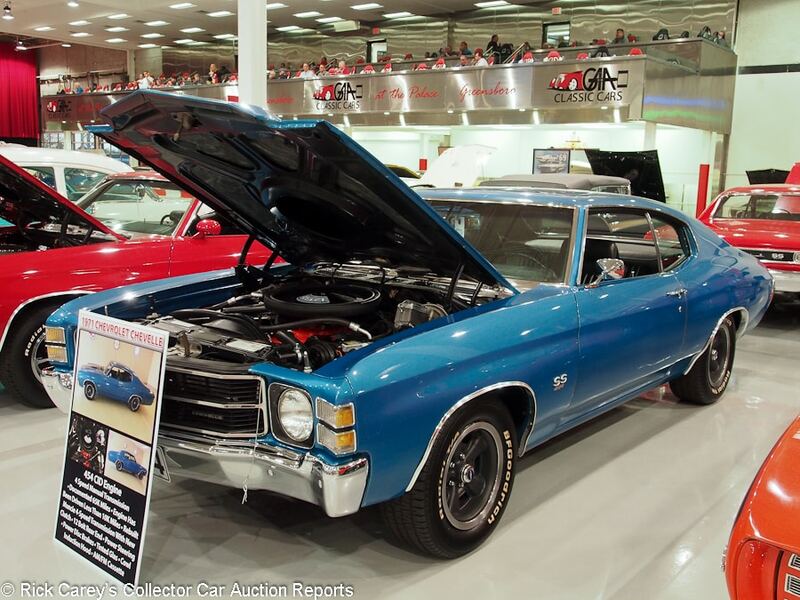 Lot # ST0118 1971 Chevrolet Chevelle SS 454 2-Dr. Hardtop; S/N 136371B202265; Metallic Blue, Black hood stripes/Black vinyl; Older restoration, 2- condition; Hammered Sold at $34,500 plus commission of 7.00%; Final Price $36,915. With Reserve. – 454/425hp, 4-speed, tube headers, Hurst shifter, Jensen cassette stereo, buckets and console, air conditioning, power steering and front disc brakes, dark grey mag style wheels, Radial T/A tires, cowl induction hood. – Very good paint, chrome and interior. Lightly scuffed roof trim chrome. Sound upholstery and interior trim. Restored then lightly used engine compartment and chassis. Not pristine but very good although lacking any representation this was its original configuration. 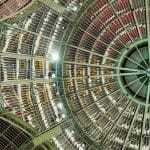 – And, without clear-cut assurances of original 454-ness it is necessary to act as if it’s a clone. 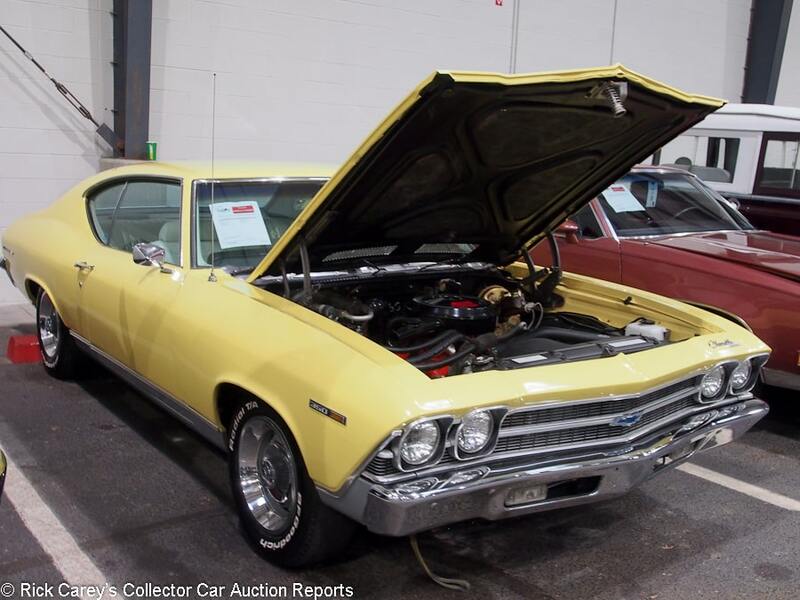 In this case a very well done clone, which this result accurately reflects in a price that the new owner could not duplicate for anywhere close to this number even starting with a very good ’71 Chevelle. 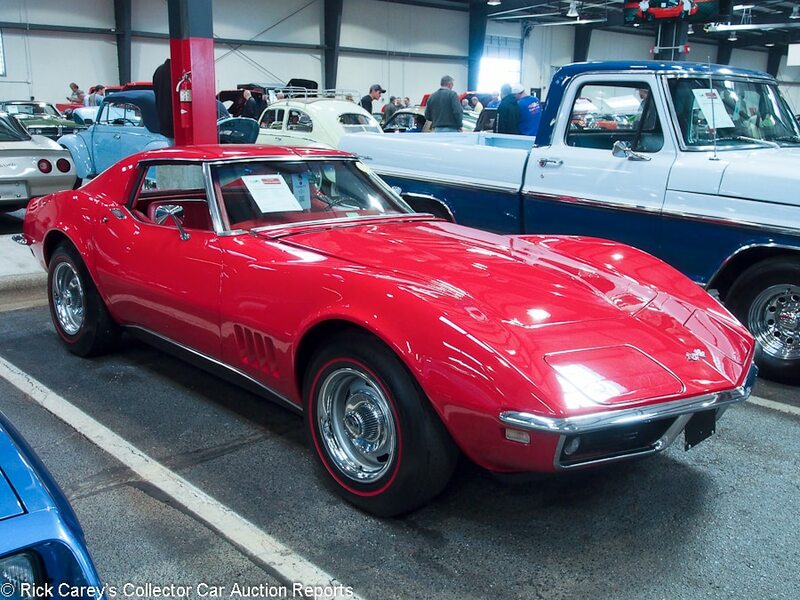 Lot # TH0074 1968 Chevrolet Corvette Coupe; S/N 194378S428523; Engine # 18S428523 V0718HT; Rally Red/Red vinyl; Visually maintained, largely original, 3 condition; Hammered Sold at $29,000 plus commission of 7.00%; Final Price $31,030. With Reserve. – 327/350hp, 4-speed, power steering and brakes, Rally wheels with trim rings, red line tires, gauges, AM-FM, tee tops, woodgrain steering wheel. – Fresh, quick repaint, sound older upholstery. The top of the engine has been superficially dressed up and there are new tires and bumper chrome. Beyond that it is an old car fluffed up for the auction. – This is an initially attractive Corvette that rewarded its consignor with a modestly generous price that reflected its eye-appeal rather than its underlying condition. 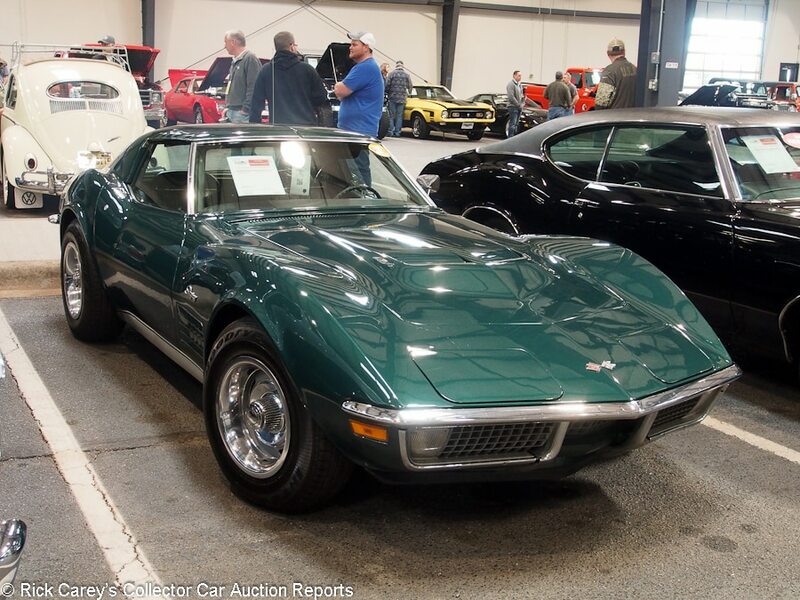 Lot # TH0077 1971 Chevrolet Corvette Coupe; S/N 194371S113488; Brands Hatch Green/Black vinyl; Visually maintained, largely original, 3- condition; Hammered Sold at $23,000 plus commission of 7.00%; Final Price $24,610. With Reserve. – 454/365hp, 4-speed, AM-FM, Rally wheels with trim rings, BFG radial tires, Hurst shifter, tee tops. – One old poor quality, blistered in front of the hood, scuffed repaint. Some masking misses. Thin bumper chrome. Represented as the matching numbers engine. Not bad, but far from good. – This is an appropriate result for a mediocre LS5 Corvette, a car that makes up in immense, thunderous, torque what it lacks in refinement. 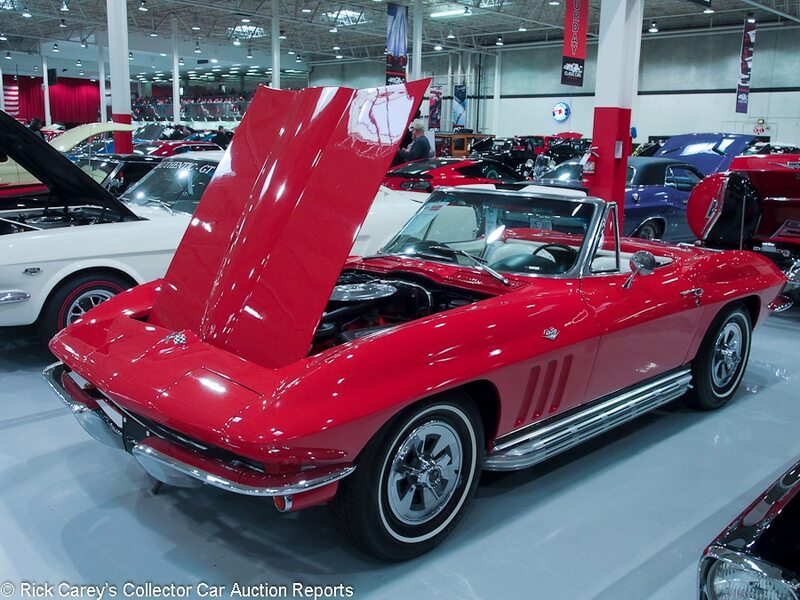 Lot # ST0154 1965 Chevrolet Corvette Roadster; S/N 194675S121146; Engine # 5121146 F0625HF; Red/Red vinyl; White vinyl top; Visually maintained, largely original, 3- condition; Hammered Sold at $53,000 plus commission of 7.00%; Final Price $56,710. With Reserve. – 327/300hp, 4-speed, side exhaust, spinner wheel covers, narrow whitewalls, AM-FM, Positraction, power antenna. – Sound clearcoat repaint with small areas of inadequate wet sanding. Lightly soiled original interior in very good condition but with a few rust flakes on the seat from the rusty top frame. Old, discolored top. Weak chrome trim and scuffed stainless. Dirty, sloppily painted engine compartment. Old undercoat flaking off in chunks. Good bumper chrome and wheel covers. Barely a usable driver. – The rust flakes falling off the top frame peppered the seats like dandruff, making the prospect of erecting or dropping the top from inside something less than appealing and reflecting the erratic presentation. Buying a Corvette with so many obvious needs is an exercise in desire over judgment and this one would have been better bought at $43,000 than at $53,000 hammer. 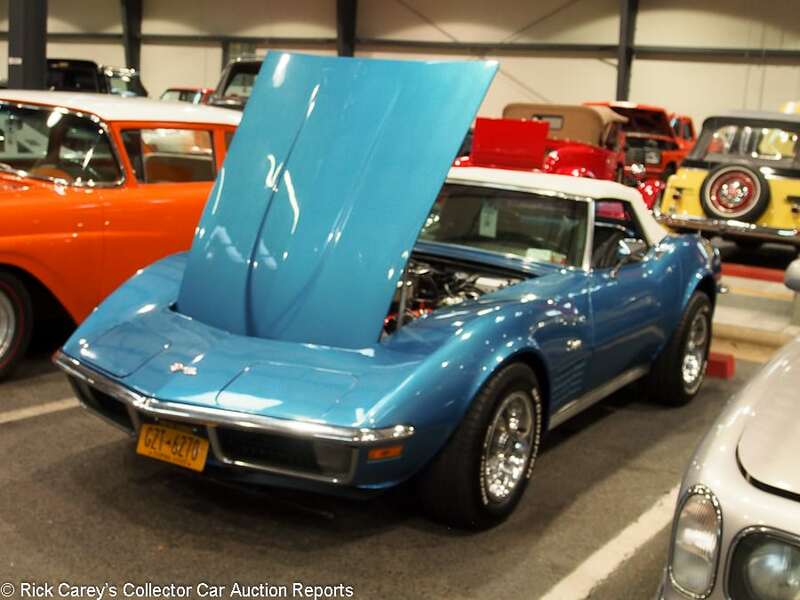 Lot # TH0083 1970 Chevrolet Corvette Roadster; S/N 195670S414341; Light Blue/Black vinyl; White vinyl top; Visually maintained, largely original, 3- condition; Hammered Sold at $22,000 plus commission of 7.00%; Final Price $23,540. With Reserve. – 350/300hp, Hydramatic, power steering and brakes, Dual CD stereo, rally wheels with hubcaps and trim rings, Radial T/A tires. – Sound but mediocre old repaint, cracks by the headlight doors. Good interior, top and gauges. The engine, the space it sits in and the underbody are superficially repainted over whatever was there. An auction car. 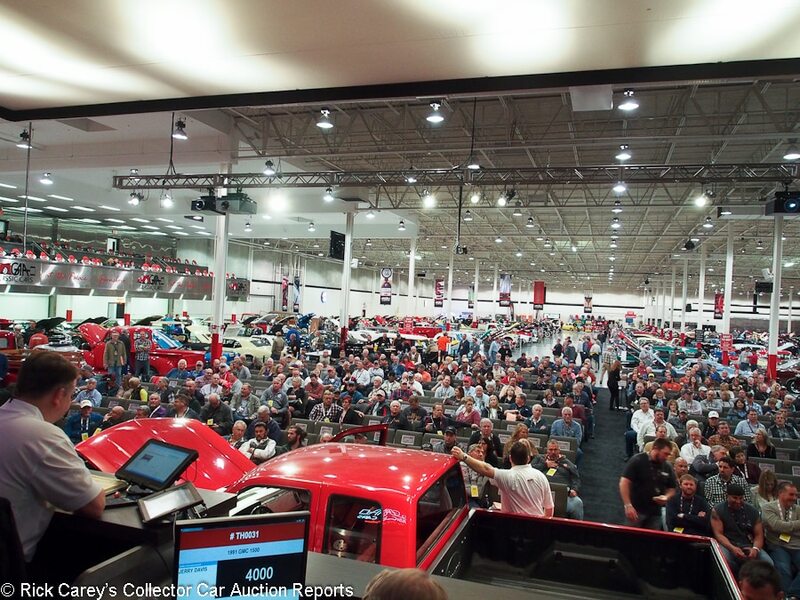 – Both consignors and buyers at the GAA Auction in Greensboro displayed a sensitivity to, and astute observation of, the cars in the sale, selling and buying cars a realistic prices reflecting their qualities and their shortcomings. This Corvette had many shortcomings, and sparse qualities, which are both reflected in this result. 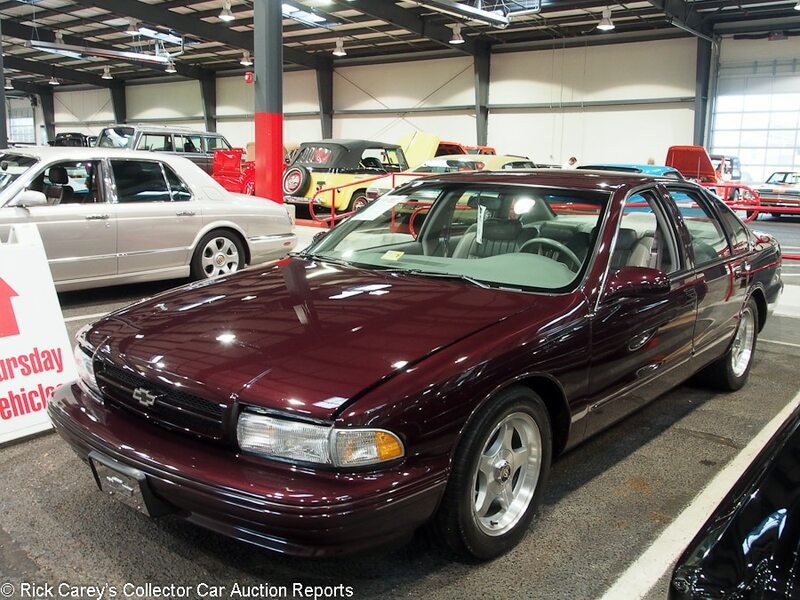 Lot # TH0085 1995 Chevrolet Impala SS 4-Dr. Sedan; S/N 1G1BL52P0SR124414; Black Cherry/Grey leather; Unrestored original, 3+ condition; Hammered Sold at $14,500 plus commission of 7.00%; Final Price $15,515. With Reserve. – 350/260hp, automatic, Pioneer CD changer, factory alloy wheels, GForce T/A tires. – Clearcoated original paint that has been exposed to some etchant on the hood. The upholstery is lightly surface creased but otherwise hardly worn or soiled. The engine compartment is clean, orderly and original, as is the underbody. Represented as one owner and 49,303 miles and looks like it. – When it was introduced the Impala SS was a revelation, a competent chassis and powerful engine encased in an immense Caprice 4-Dr. Sedan body that showed just how competent Chevrolet’s engineering staff was in overcoming ‘road-hugging weight.’ It takes only a little to make it breathe fire but even in stock configuration like this it is a highly satisfying family cruiser and in this case bought at a reasonable price reflecting its originality, condition and mileage. 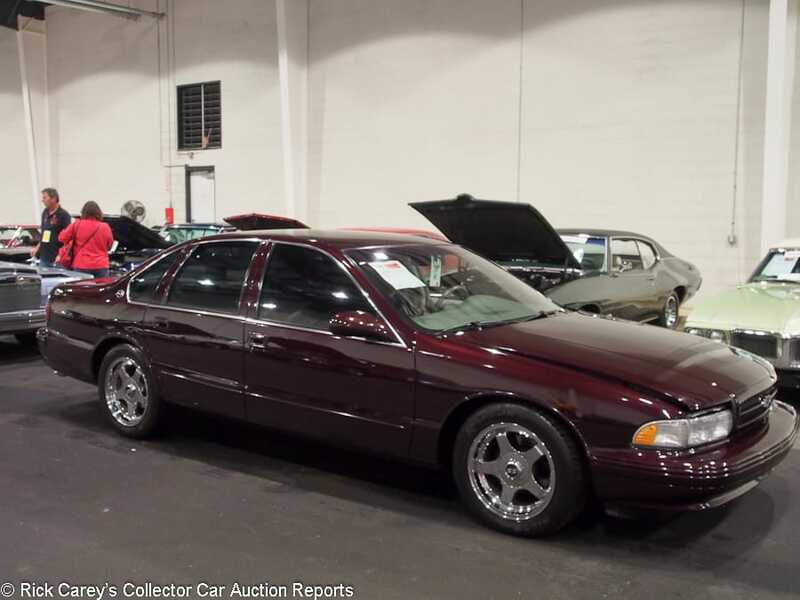 Lot # TH0050 1996 Chevrolet Impala SS 4-Dr. Sedan; S/N 1G1BL52P4TR152444; Black Cherry/Grey leather; Unrestored original, 3 condition; Hammered Sold at $10,000 plus commission of 7.00%; Final Price $10,700. With Reserve. – 350/260hp LT1, Hydramatic, Alpine CD stereo, polished factory alloy wheels, Riken tires, K&N air intake. – Good original paint, surface creased original upholstery with a small scrape on the driver’s seat bolster and a tiny puncture on the cushion. The underside got a quick squirt of chassis black. The engine compartment is original. Looks pretty much like it did on the Power Tour in 2014. – This Impala SS is a bit more used than the one that followed it an hour later and it brought an appropriately lower price. Lot # TH0036 1969 Chevrolet Malibu 2-Dr. Hardtop; S/N 136379A346690; Yellow/White vinyl; Visually maintained, largely original, 3 condition; Hammered Sold at $20,500 plus commission of 7.00%; Final Price $21,935. No Reserve. – 350/250hp, automatic, power steering, power brakes, air conditioning, rally wheels with hubcaps and trim rings, bench seat, sport steering wheel, pushbutton radio, underdash CD stereo, tilt steering column. – Repainted assembled, some fisheyes but good wet sanding. Orderly but not restored engine compartment, wheel wells repainted over old undercoat. Sound upholstery, foggy gauge lenses. Wiper scratched windshield. Cosmetically redone to look good on the block but not by any standard restored. – Attractive and fun to own and drive, but less satisfying at this price for a car with little going for it in equipment or condition. On the other hand, the difference between this price and a reasonable one is just a few, even a couple, thousand dollars, not a lot in the overall scheme of things. 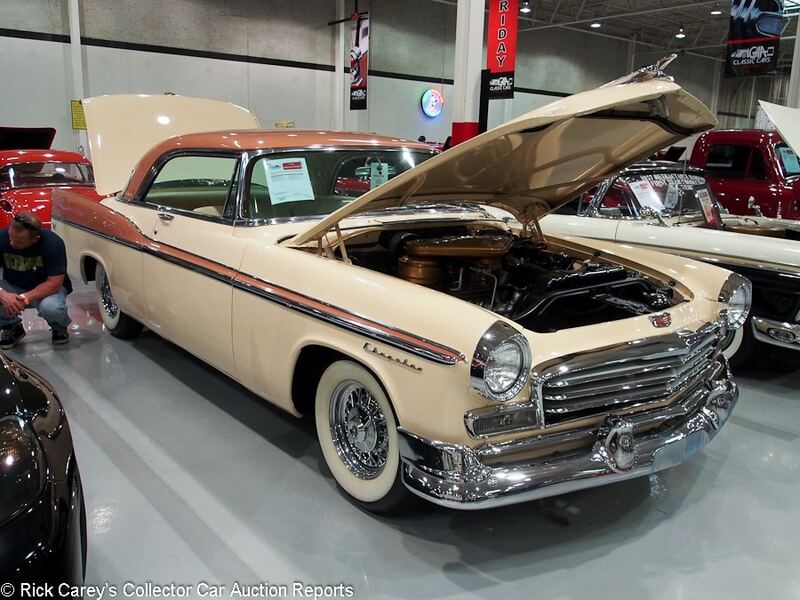 Lot # FR0255 1956 Chrysler Windsor 2-Dr. Hardtop; S/N W5663461; Sand Dune Beige, Rosewood roof and accent/Cream vinyl, Pink cloth; Cosmetic restoration, 2 condition; Hammered Sold at $43,000 plus commission of 7.00%; Final Price $46,010. With Reserve. – Dual quad Hemi, pushbutton Powerflite automatic, power steering and brakes, pushbutton radio, chrome wire wheels, wide whitewalls, bumper tips. – Very good older repaint and largely original interior. Good major chrome, lightly scuffed stainless and pitted chrome trim. Orderly engine compartment, chassis and underbody. AACA National First Prize and Senior restoration done to the standards of an earlier time, showing some age but limited use. – The scant description of this car leaves onlookers to wonder what’s under the hood. Is it a 331 Windsor Hemi with a dual quad intake or a special order Windsor with the 354/340hp dual quad 300B engine? We’re left with indecision, which defaults to skepticism, although its prior appearance at Mecum Kissimmee in 2012 represents it as a dual quad 331. It was sold at Auburn Fall in 2010 for $26,950 and the result here is heroic. 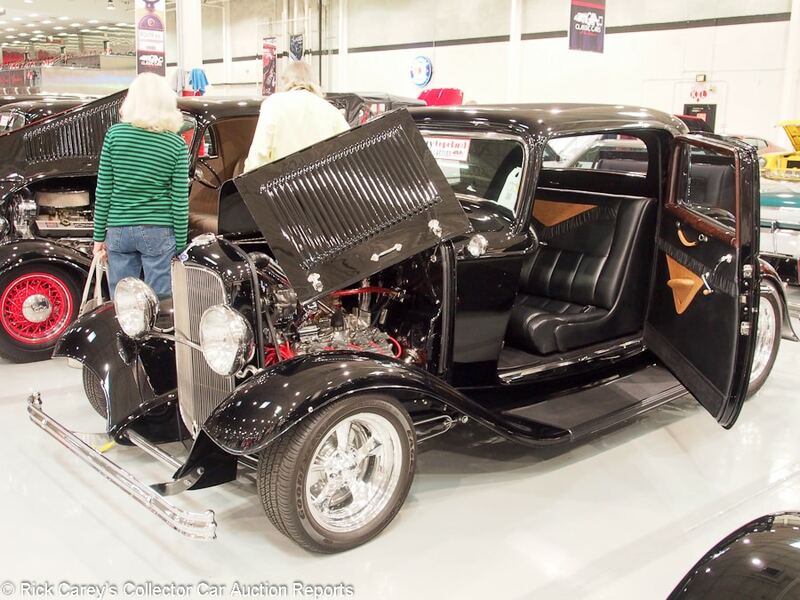 Lot # ST0103 1932 Ford Coupe 3-Window; S/N P122164; Black/Black leather, Tan ostrich accent; Modified restoration, 2- condition; Hammered Sold at $87,000 plus commission of 7.00%; Final Price $93,090. No Reserve. 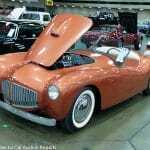 – Ford steel body, Flathead V8, Cyclone aluminum heads, Edelbrock intake, dual Ford 2-barrel carbs, alternator, 4-speed, electronic ignition, Buick finned aluminum brakes, Coddington aluminum wheels, Halibrand quick change diff, Mullins steering box, rumble seat. – Very good paint and chrome. 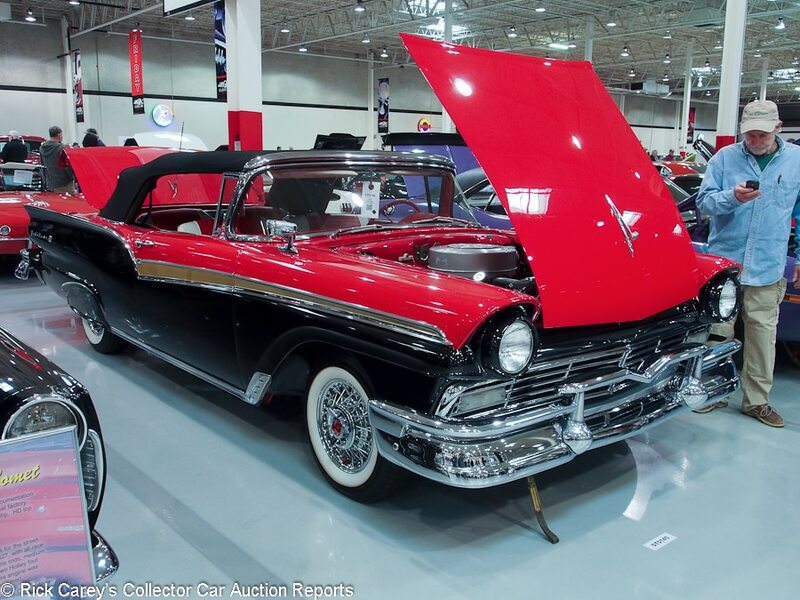 Lot # ST0145 1957 Ford Fairlane 500 Convertible Sunliner; S/N D7KC137439; Red, Black/Red, White vinyl; Black cloth top; Older restoration, 2- condition; Not sold at Hammer bid of $60,000 plus commission of; Final Price $60,000. With Reserve. – 312/245hp, automatic, power steering, power seat and windows, V-bar grille guard, skirts, chrome wire wheels, wide whitewalls, pushbutton radio, skirts, continental kit. – Sound repaint applied to an assembled body with some masking misses. Sound chrome but the left side top boot molding was replated over unfilled small pits and the fin rear trim chrome is thin. The engine, chassis and suspension were restored like new but now are aged, lightly oil misted and a little grimy. Showy, but not showable. – Sold at Mecum’s Houston auction in April 2015 for $86,400, the oversights in the repaint and some details are disconcerting and the Greensboro bidders hedged their bets appropriately with this offer. The consignor may have to reconsider. 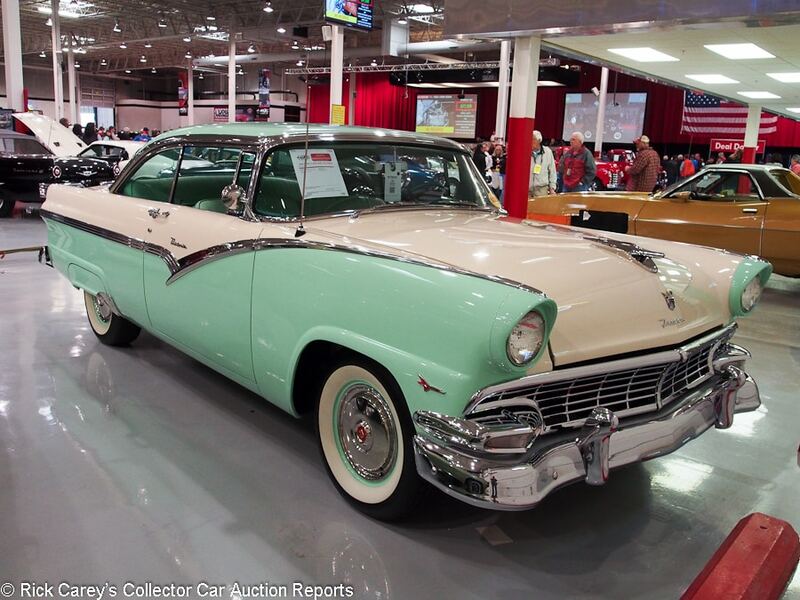 Lot # ST0057 1956 Ford Fairlane Victoria 2-Dr. Hardtop; S/N P6LV167455; Light Green, Colonial White/Light Green vinyl, Dark Green cloth; Recent restoration, 2+ condition; Hammered Sold at $47,000 plus commission of 7.00%; Final Price $50,290. With Reserve. – 312/225hp, automatic, power steering, pushbutton radio, wheel covers, whitewalls, dual outside mirrors, heater, skirts. – Excellent paint, chrome and interior. The engine compartment, chassis and underbody are better than new aside from a little brake fluid paint bubbling on the firewall behind the master cylinder. – This is nearly a concours Fairlane, and it brought a nearly concours price as it should. 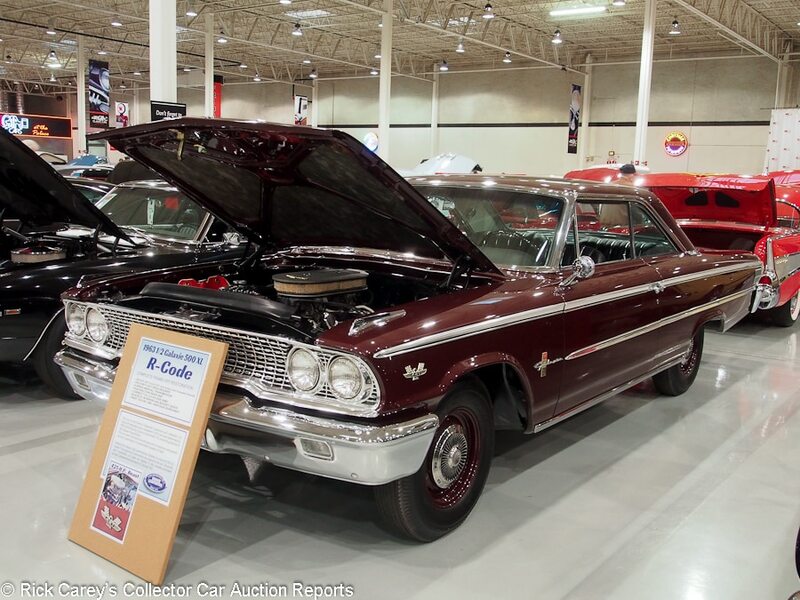 Lot # ST0128 1963 Ford Galaxie 500XL 2-Dr. Hardtop; S/N 3W68R155115; Heritage Burgundy/Black vinyl; Recent restoration, 2+ condition; Hammered Sold at $69,000 plus commission of 7.00%; Final Price $73,830. With Reserve. – 427/425hp, dual quads, 4-speed, hubcaps, Firestone bias ply tires, buckets and console, pushbutton radio, dual outside mirrors. – Excellent paint, chrome, bright trim and interior. The engine compartment, chassis and underbody are better than new but not overdone. 2015 restored by Precision Rod & Custom, supervised by Donald Allen, impeccable and represented as the original engine and carburetors. – I have no idea on God’s Green Earth why this Galaxie 500XL should be so cheap. Literally none, especially with its meticulous restoration and representation that the engine is original. It should have been well into six figures. Someone knows a lot that I don’t, or seized a momentary lapse in the market’s judgment to take home a bargain trophy car. 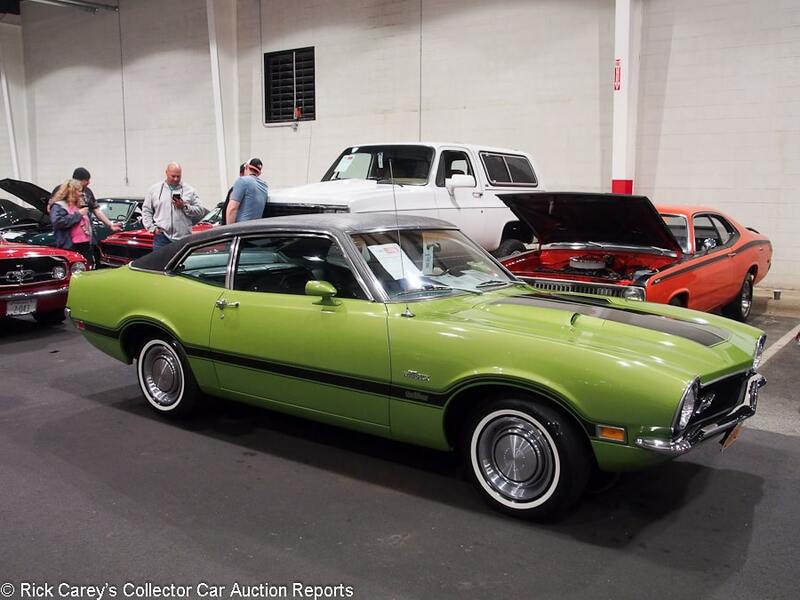 Lot # TH0047 1972 Ford Maverick Grabber 2-Dr. Sedan; S/N 2X93F244297; Lime Green Metallic, Black hood and vinyl roof/Black vinyl; Cosmetic restoration, 3 condition; Hammered Sold at $17,000 plus commission of 7.00%; Final Price $18,190. With Reserve. – 302/140hp, automatic, power steering, power brakes, factory air conditioning, hubcaps and trim rings, narrow whitewalls, bench seat, pushbutton radio. – Gaudy clearcoat repaint, good interior and roof vinyl. Cosmetically restored to look good at twenty feet. Dirty, oily and road grimy underneath. Pitted door handles and parking light bezels. An auction car. – Grabbers usually are sixes, putting the 302/140hp V8s is somewhat rarified air. That’s not enough to offset the tacky presentation of this one, however, and it is expensive at this price. 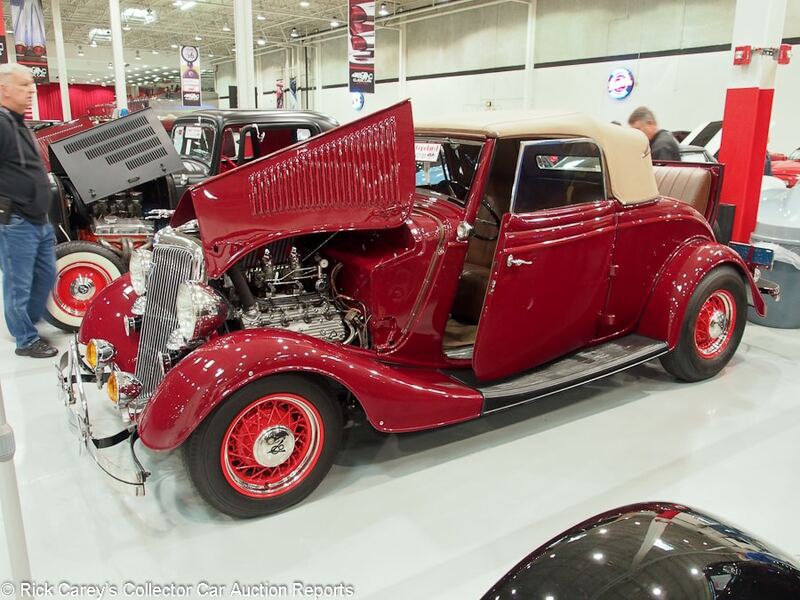 Lot # ST0099 1934 Ford Model 18 Cabriolet; S/N 1882054; Dark Red/Brown leather; Beige cloth top; Modified restoration, 2- condition; Hammered Sold at $95,000 plus commission of 7.00%; Final Price $101,650. No Reserve. – Henry Ford steel body, 8BA flathead, aluminum heads, Mouist intake, dual Strombergs, 12v alternator, headers, Columbia 2-speed rear, juice brakes, Fog King fog lights, banjo spoke steering wheel, factory gauges, rumble seat, grille guard. – Good older repaint with a few small chips. Some polishing swirl on the headlight chrome. Orderly and clean but aged engine compartment and chassis. Gary Copeland Collection. – This was one of a succession of Fords from the Gary Copeland Collection offered without reserve on Saturday in Greensboro, all carefully built and precisely maintained. 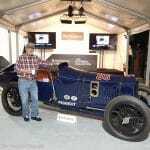 A few were stock, but most had flathead or Chevy V8 powertrains, with the flathead-powered cars reported here. The result here isn’t a lot for a pride of ownership stock-appearing ’34 street rod with delicious equipment. 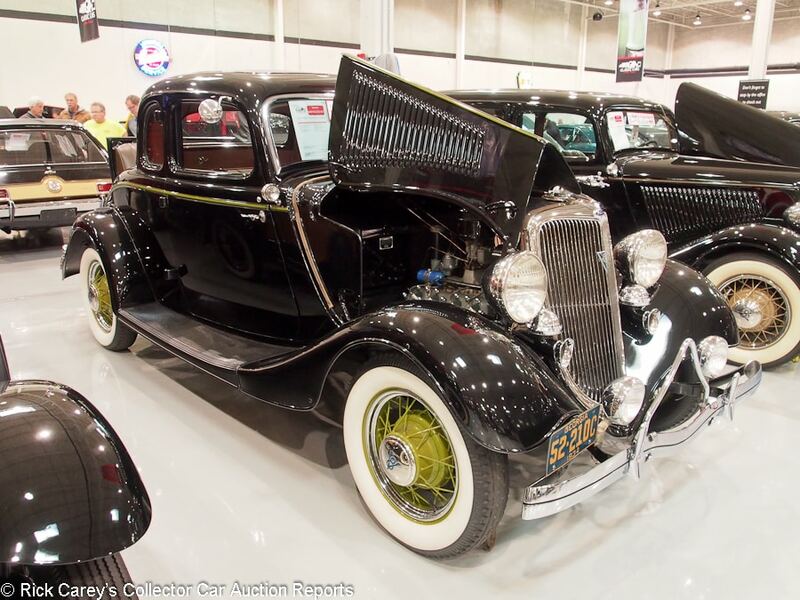 Lot # ST0107 1934 Ford Model 18 Coupe 5-Window; S/N 18595521; Black/Brown mohair; Older restoration, 3+ condition; Hammered Sold at $55,000 plus commission of 7.00%; Final Price $58,850. No Reserve. – Stock flathead, turn signals, B-L-C fog lights, dual horns and taillights, rumble seat, Olive wire wheels, wide whitewalls, enclosed rear-mounted spare, grille guard. – Sound older paint, chrome and interior. Windshield wiper arm missing. Good interior woodgraining. Orderly but aged engine compartment and chassis. A handsome driver quality older restoration. Gary Copeland Collection. – This isn’t the best car among Gary Copeland’s V8 Fords, but it is more than good enough to deserve the handsome price it brought. 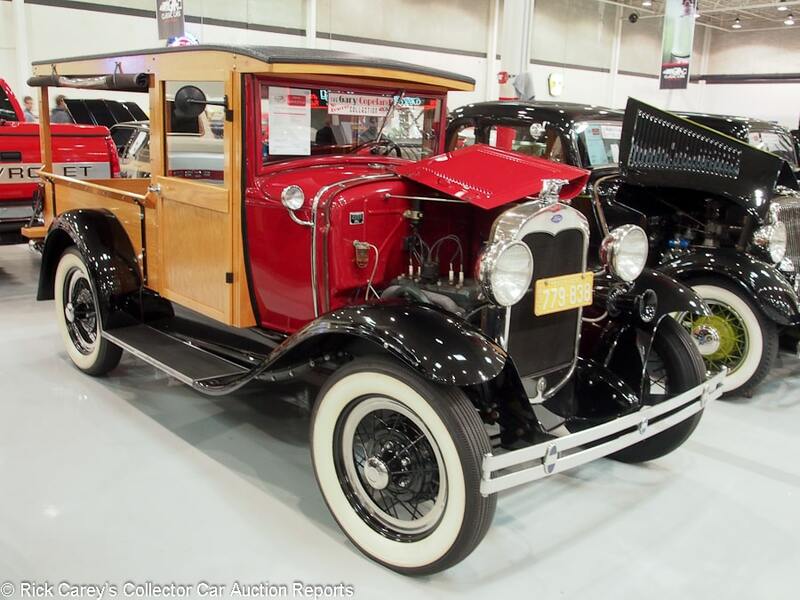 Lot # ST0108 1930 Ford Model A Huckster Truck; S/N A4315825; Red, Wood, Black fenders/Black leatherette; Rebodied or re-created, 2- condition; Hammered Sold at $25,000 plus commission of 7.00%; Final Price $26,750. No Reserve. – Black wire wheels, wide whitewalls Black rollup side curtains, dual taillights, single vinyl-wrapped sidemount with mirror, quail radiator cap. – Recent wood huckster body with very good oak woodwork and varnish. Very good paint, interior and side curtains. Good chrome except someone hit the radiator shell with a sander leaving swirl scratches. The engine and chassis were restored but quite a while ago and are dusty and oily. There is a good chance a thorough detailing and some touchup underneath could make a big improvement. Gary Copeland Collection. – Professionally done if somewhat aged and used, with exceptional new wood and soft trim. It wouldn’t be unrealistic to see it bringing twice this much where its charm and utility would outweigh its recent creation. For today, though, it is a solid value. Lot # ST0111 1932 Ford Model B Coupe 5-Window; S/N 5014323; Brown, Black fenders and accent/Tan cloth; Older restoration, 2- condition; Hammered Sold at $45,000 plus commission of 7.00%; Final Price $48,150. No Reserve. – Rumble seat, body color wire wheels, wide whitewalls, vinyl covered spare, dual taillights, Sparton horn. – Good chrome and interior. Good paint with some light orange peel on the hood sides. Restored like new some time ago and still very good, just a little dusty. – Henry Ford really didn’t have much confidence in the V8 and continued the Model A-based Model B into the early 30’s, a choice that was thoroughly rejected by even Depression-era buyers who thronged to the V8, paying $50 more for its performance and panache. Who could blame them, but that makes the survival of this Model B Deuce Coupe even more exceptional, a car that decades ago should have been chopped, channelled, lowered and re-engined into a street rod. Like it? A lot, even at this price. 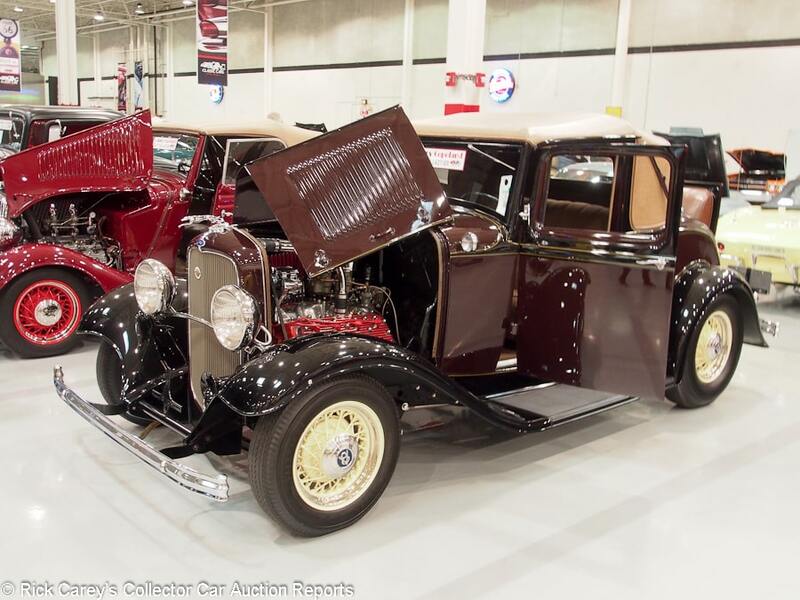 Lot # ST0098 1932 Ford Model B Sport Coupe; S/N AB5059358; Burgundy, Black fenders, Beige vinyl roof/Brown cloth; Modified restoration, 2- condition; Hammered Sold at $70,000 plus commission of 7.00%; Final Price $74,900. No Reserve. – Stewart Warner vintage style gauges, Cream wire wheels, rumble seat, flathead V8, Offenhauser heads, aluminum intake, dual Ford 2-barrels, 12v alternator, headers, Smitty mufflers, aluminum radiator, front disc brakes, dropped front axle, 9″ Ford rear axle, automatic. – Sound repaint but with orange peely hood sides and dirt and dust inclusions. Good interior and chrome. The vinyl roof covering is incongruous. The engine compartment and chassis are not fresh, but could be close with a little effort and elbow grease. Gary Copeland Collection. – This Copeland Ford is somewhat challenged, not only with its equipment but also with its presentation and it brought a surprisingly strong price for what it is. 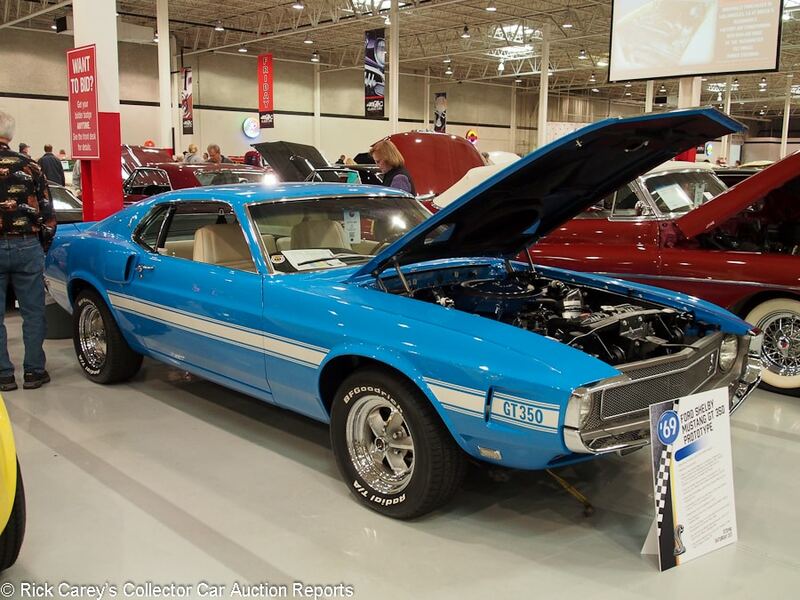 Lot # ST0148 1970 Ford Mustang GT350 Prototype Fastback; S/N 9F02M48392; Grabber Blue/Pearl White vinyl; Recent restoration, 2+ condition; Hammered Sold at $71,000 plus commission of 7.00%; Final Price $75,970. With Reserve. – 351/290hp, 4-speed, Shelby alloy wheels, Radial T/A tires. – Excellent paint, interior and chrome. The chassis and engine compartment are like new. Claimed to be the Shelby 1970 emissions testing prototype, color changed at some point. – OK, who cares? It isn’t a Shelby, it’s a Ford (like all ’70 Shelbys if the fact were acknowledged.) Emissions testing? What difference does it make? It’s a neat car, in very good condition, but it’s hardly worth more than an ordinary M-code ’70 Mustang, about $60,000. 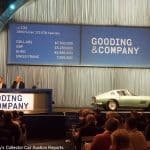 The Greensboro bidders paid a small premium for the apocryphal Shelby history. 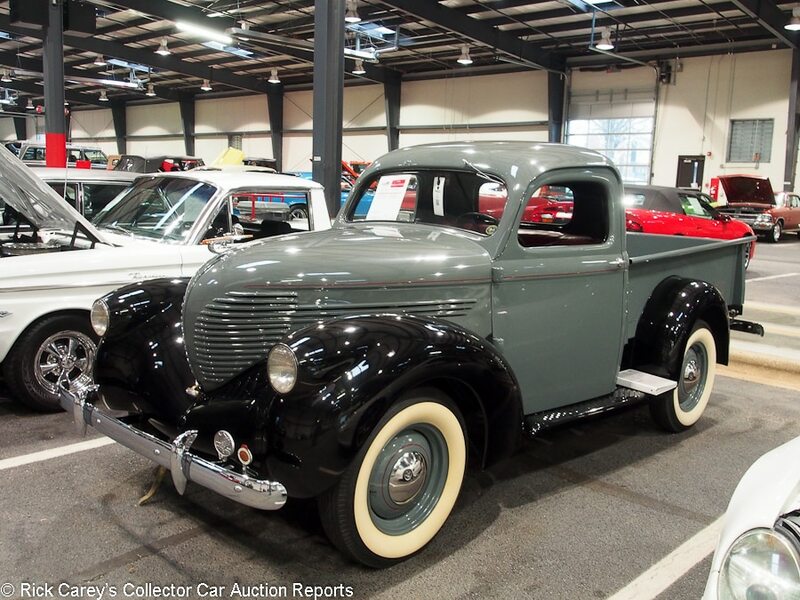 Lot # ST0109 1939 Ford Standard Coupe 5-window; S/N 186274529; Black/Beige mohair; Visually maintained, largely original, 3 condition; Hammered Sold at $28,000 plus commission of 7.00%; Final Price $29,960. No Reserve. – Hubcaps, trim rings wide whitewalls, banjo spoke steering wheel, heater. – Good repaint, replaced interior and chrome. Otherwise a clean and orderly original car, probably never fully apart. Gary Copeland Collection. – This is a sweet old, never hot-rodded, Ford, thoughtfully preserved and sympathetically presented. It brought a modest price that belies its preservation and attractive 5-window coupe body style. 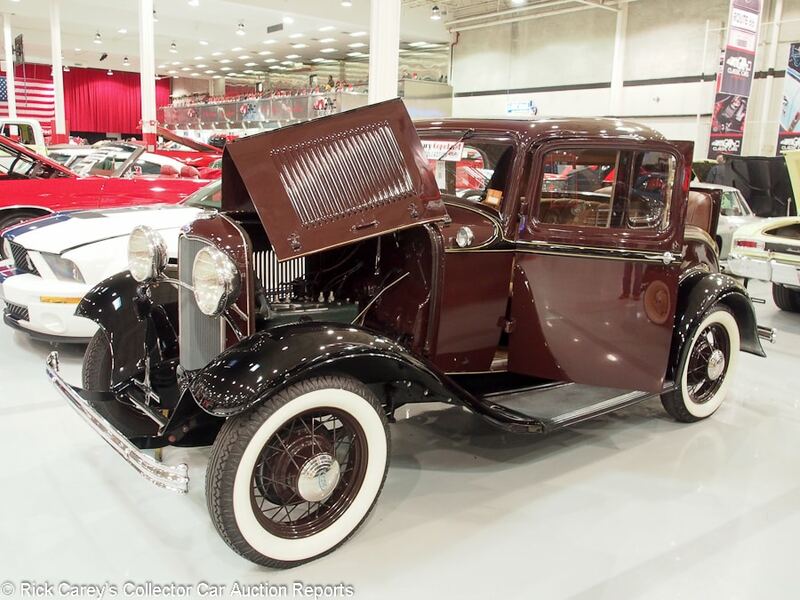 Lot # ST0106 1934 Ford Standard Fordor Sedan; S/N 18967920; Black/Beige cloth; Older restoration, 3+ condition; Hammered Sold at $37,500 plus commission of 7.00%; Final Price $40,125. No Reserve. – 59A-B 1948 flathead V8, Classic Instruments gauges, Fog-King fog lights, Sand Beige wire wheels, wide whitewalls, hydraulic brakes, greyhound radiator cap, grille guard, enclosed rear-mounted spare. – Good paint, chrome and interior. Engine compartment and chassis show some age and use. Gary Copeland Collection. 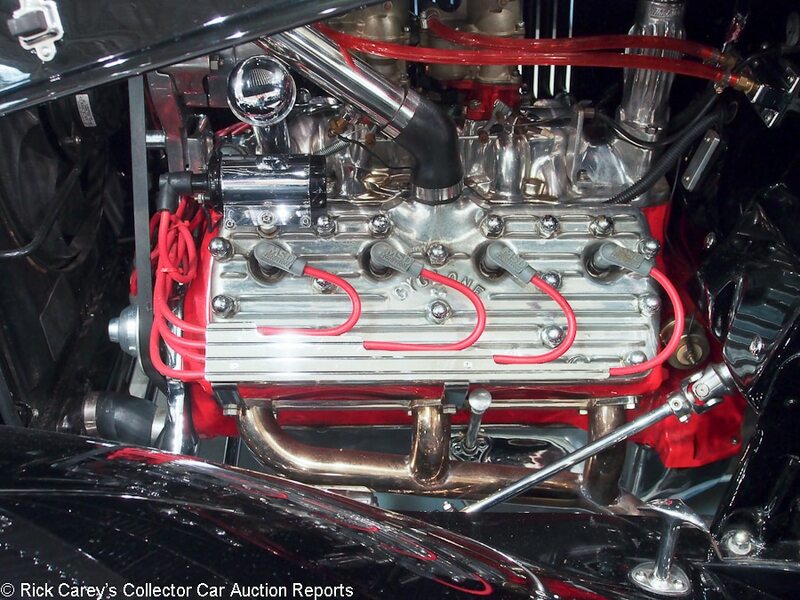 – This is a challenged price for a ’34 Fordor with a later engine. You either like it or you don’t, and the Greensboro bidders obviously liked it a lot. 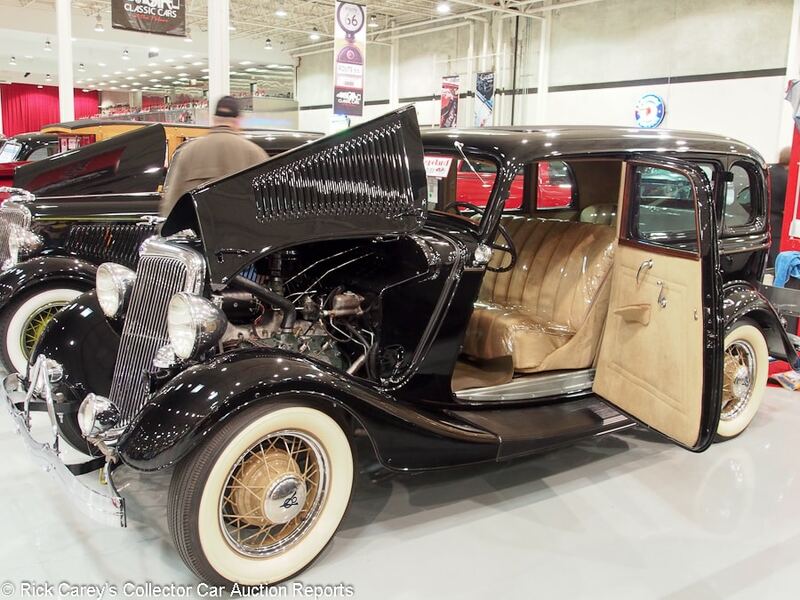 Lot # ST0110 1934 Ford Standard Victoria Sedan; S/N 1889973; Black/Tan mohair; Older restoration, 3+ condition; Hammered Sold at $41,000 plus commission of 7.00%; Final Price $43,870. No Reserve. – Alternator, factory radio, 12 volt electrics, Cream wire wheels and coachline, grille guard, wind wings, enclosed rear-mounted spare, dual taillights, billet gas cap. – Good older paint with a few small chips and scratches. Good chrome and original interior. The underbody, chassis and engine have been restored then driven. The chassis is a little oily and road grimy. More than good enough to enjoy on the road and at the end of the day. Gary Copeland Collection. – The Victoria Sedan is an unusual body style, but this one brought open Roadster or Cabriolet money, a generous price for an aged restoration. 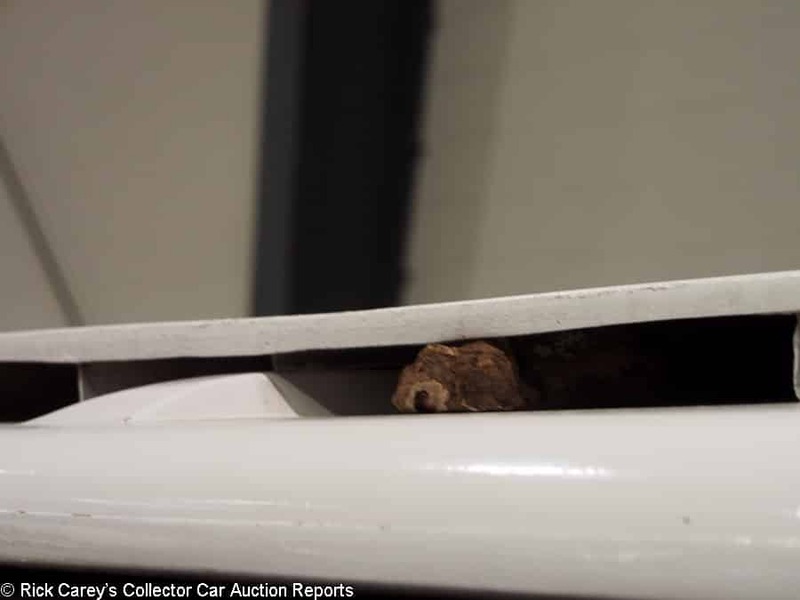 In the preview this piece of tree branch was wedged into the gap at the front of the double layer Safari roof, an indicator of the neglected presentation of this rat. 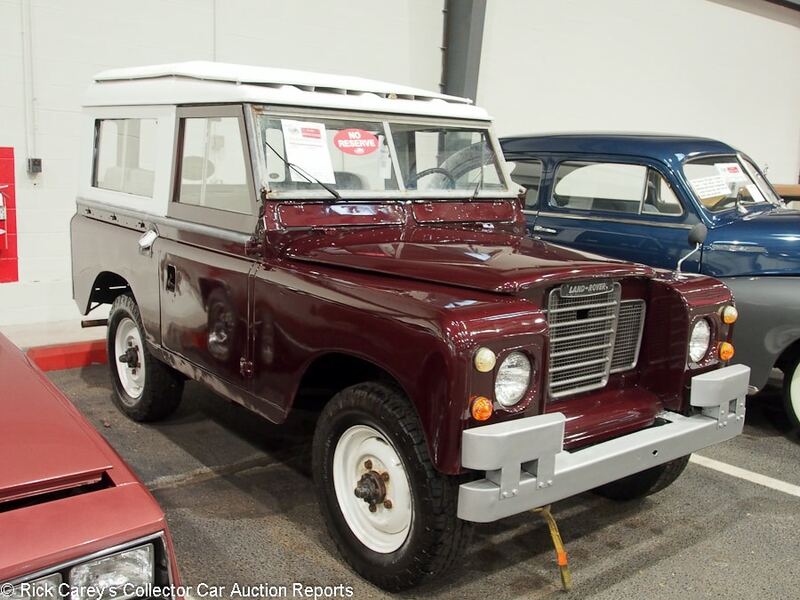 It was removed before it came on the block but the bidders weren’t fooled and gave it a restoration project price that it fully deserved, maybe the cheapest LR SII in North America this week. 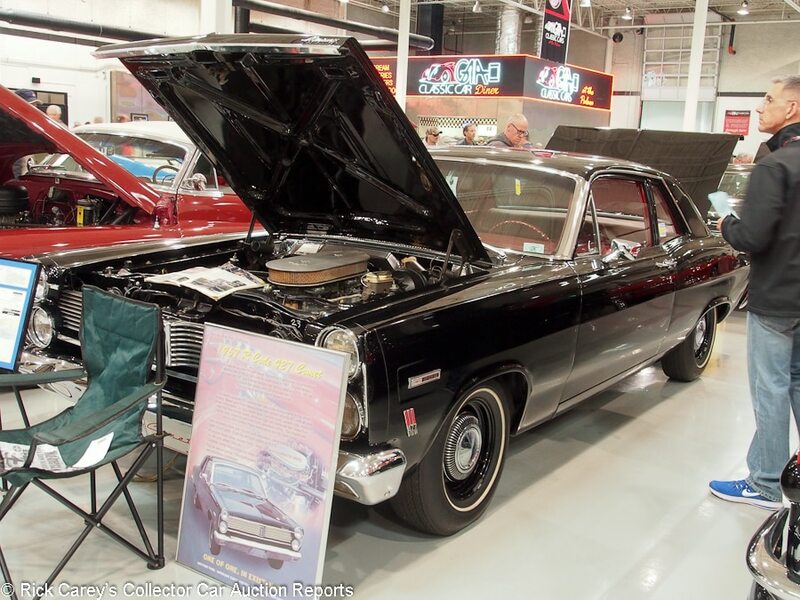 Lot # ST0146 1967 Mercury Comet 202 2-Dr. Sedan; S/N 7H01R546391; Black/Red vinyl; Older restoration, 2- condition; Hammered Sold at $100,000 plus commission of 7.00%; Final Price $107,000. With Reserve. – 427/425hp, 4-speed, 3,91 Traction-Lok, power brakes, bench seat, heater, pushbutton radio, dog dish hubcaps, narrow whitewalls. – Sound older repaint over old paint with minor scuffs and chips. Very good interior. Engine compartment is only slightly aged and nearly like new, as is the underbody. Marti Report documented. – Sold at Russo and Steele in Scottsdale in 2017 for $118,800, it is hard to fault this base Comet with its medium riser dual quad 427/425hp intake and 4-speed. It’s also impossible to fault the price it brought. 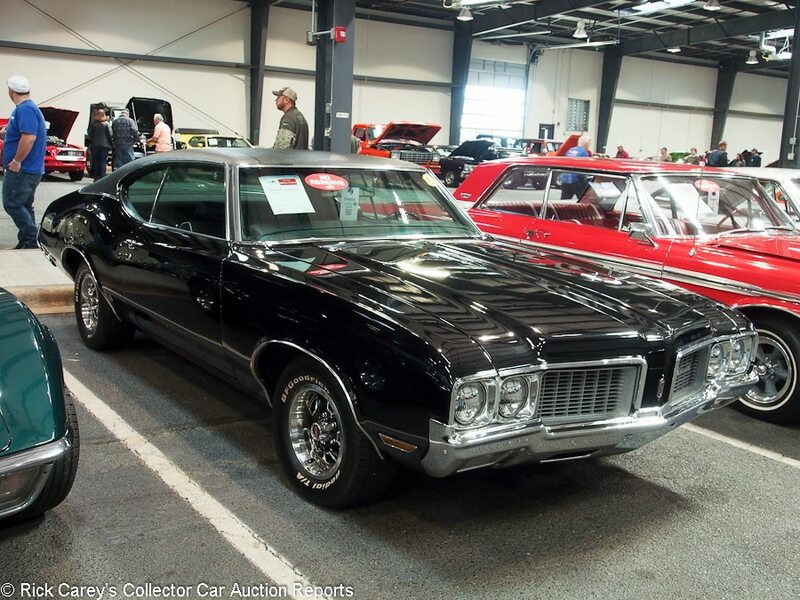 Lot # TH0078 1970 Oldsmobile Cutlass Supreme 2-Dr. Hardtop; S/N 336870E171272; Black, Black vinyl roof/Black cloth; Visually maintained, largely original, 3- condition; Hammered Sold at $17,500 plus commission of 7.00%; Final Price $18,725. No Reserve. – 350/310hp, automatic, bench seat, underdash gauges and tach, Rally wheels with trim rings, Radial T/A tires. – Custom fabric upholstery. Fair older repaint erratically wet sanded and polisher scuffed. Uneven door gaps. Brightly rechromed bumpers and some incongruously bright aftermarket trim pieces between scuffed original stainless. Original undercoat. An auction car. 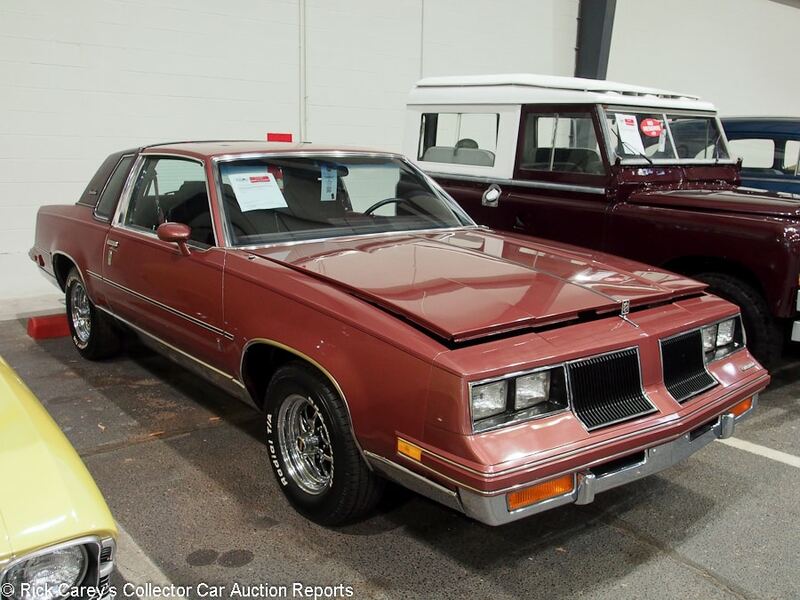 – The seller should be very satisfied with getting this much for this seriously mediocre Cutlass. 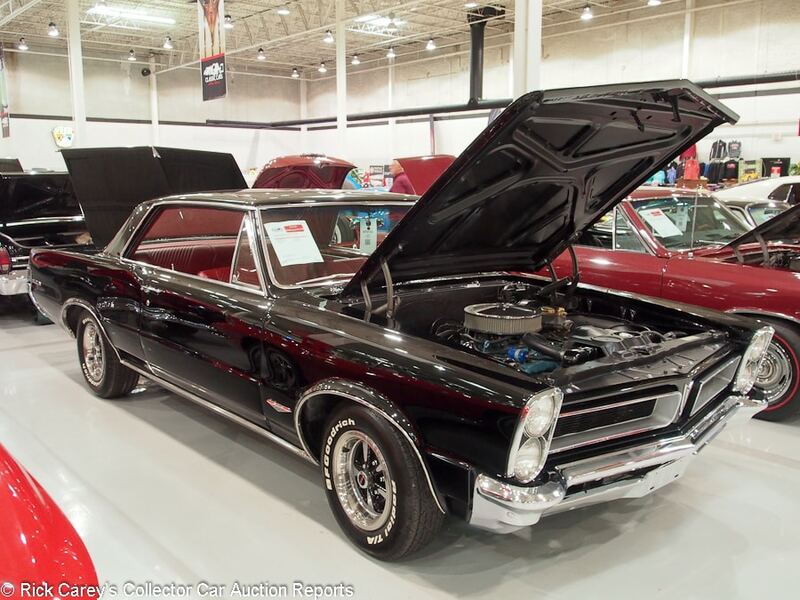 Lot # ST0153 1965 Pontiac LeMans GTO 2-Dr. Hardtop; S/N 237375Z134271; Engine # 709553WT; Black/Red vinyl; Visually maintained, largely original, 3 condition; Hammered Sold at $34,500 plus commission of 7.00%; Final Price $36,915. With Reserve. – 389/335hp, 4-speed, Hurst shifter, power steering, power brakes, Magnum wheels with trim rings, Radial T/A tires pushbutton radio, buckets and console, PHS documentation, woodgrain steering wheel. – Thick, flawed repaint over old paint. Window pockets thick with body shop dust. Good major chrome and window frames, dull windowsill moldings. Foggy gauge lenses and aged dash and console. The engine has been out and redone but its compartment has only been black bombed, as has the underbody. Good new interior. Cosmetically redone for the auction, otherwise unsatisfying. – Sometimes early GTOs bring remarkably modest prices considering their status as the initiator of the Muscle Car era. This one, however brought reasonable money for its nasty repaint and other equally nasty features. It’s neglected, ignored than superficially redone for the auction and it could have brought less without being a bargain. Lot # FR0023 1938 Willys-Overland Model 38 Pickup; S/N 3879015; Grey, Black fenders, Vermillion coachlines/Brown leatherette; Older restoration, 2- condition; Hammered Sold at $28,500 plus commission of 7.00%; Final Price $30,495. With Reserve. 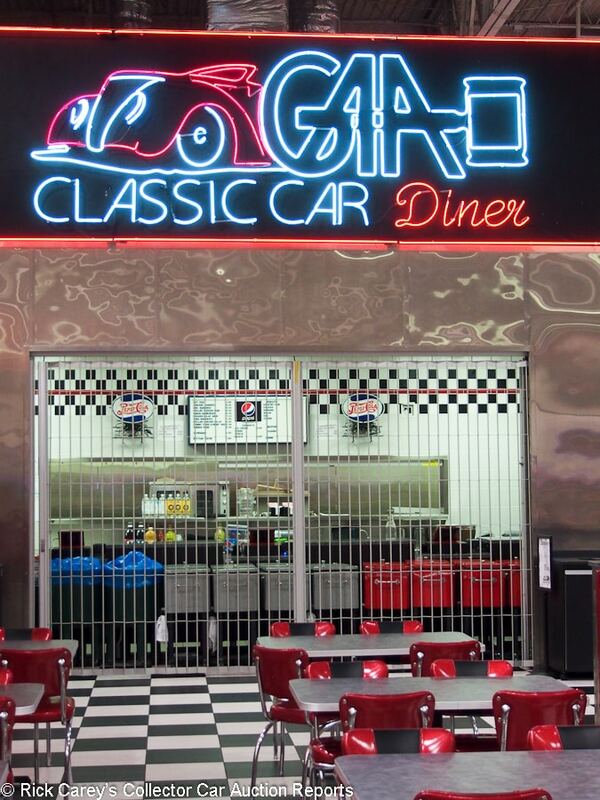 – Grey wheels, hubcaps, whitewalls, chrome bumpers, dual taillights – Very good older paint, chrome and interior. Orderly but aged engine compartment and chassis. Restored in the mid-80’s, AACA National First Prize and Senior in 1986, 18 AACA Preservation awards. Electrical system refreshed in 2017. A delightful, unusual, shark-nose Willys-Overland that has been around forever (look in the Standard Catalog of American Light-Duty Trucks for multiple pictures of it) and still sparkles. – Just about the cutest little vehicle on the planet, and a rare surviving example that has to be appreciated by anyone whose eyes fall on it. With Chevy and Ford pickups regularly bringing prices comparable with this impressively restored and preserved restoration of a rarely seen Willys-Overland the new owner should be proud of both the vehicle and the moderate price paid for it.